Pretrial Probation Parole Supervision Week | What Is PPPS Week? 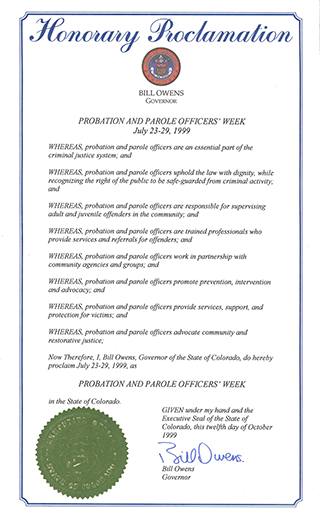 In 1999, the American Probation and Parole Association (APPA) began requesting that every state proclaim one week in July of each year as Pretrial, Probation and Parole Supervision Week! It is a time to celebrate the nearly 100,000 men and women who spend their days working to significantly enhance the footprint of community corrections to improve outcomes, both for the individual AND for the public safety of our communities. The first PPPS Week Proclamation was made by Governor Bill Owens of Colorado that year. Since that time, APPA has garnered proclamations from every state. As we celebrate the 20th anniversary of PPPS Week, APPA staff members will visit pretrial, probation, and parole offices once again. In the past few years, Executive Director Veronica Cunningham, Membership Coordinator Drilon Gojani, and Registration Coordinator Kimberly Mills have driven to multiple offices in Tennessee, Kentucky, Ohio, Indiana, Illinois, and Michigan. Each time, they showed up with small baskets of goodies to join the office celebrations. It is an opportunity to hear from the field – from line personnel to directors — to get ideas and learn what is needed and wanted in the industry and from their professional membership association, APPA. Team APPA Celebrates your Drive and Dedication! APPA has implemented many ideas from those visits. Most recently, an online community, APPA Connect, was launched. APPA Connect allows PPPS professionals the ability to reach out and talk to each other to obtain information, guidance, and support. APPA has also begun to offer discounts on various products and services. APPA is also welcoming students as members by offering student membership rates and substantially discounted training institute registration rates. And there is so much more to come...APPA is listening! On this 20th year of PPPS Week celebrations, APPA asks you to share your celebrations. APPA is merely an email or phone call away. If you are interested in having Team APPA visit your office in North or South Carolina, please let us know by emailing us to schedule a visit. If you are a company that is interested in sponsoring one of our visits, please contact us today!